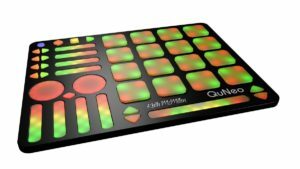 QuNeo is a different species of pad controller for electronic musicians, DJs, VJs and DIY hackers. 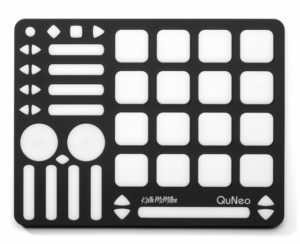 While it covers all of the functionality of other pad controllers, QuNeo adds the power of touch recognition in other dimensions. 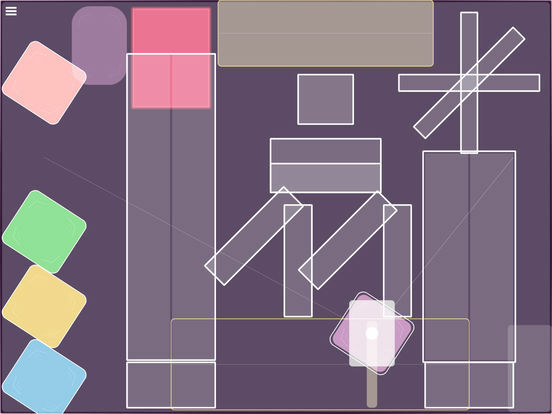 Each of the 27 pads, sliders and rotary sensors are pressure, velocity, and location sensitive. Even the 17 switches respond to how hard you press. 16 square pads provide 127 levels of Velocity response, X-Y location, and continuous pressure. 2 rotary sensors allow you to scrub, trigger, stretch, pinch and play phrases and sound files, manipulate continuous controllers and more. Each rotary sensor measures angle, pressure and distance from the center. 9 touch sensitive sliders can be mapped to fader and effects controls. LEDs within each slider act as VU meters or remind you where you were. Multi-touch lets you select a length between two fingers to set stereo locations or filter resonances. Tapping a slider can mute or toggle any track or function. Switches are located in smart groupings to select samples, fader banks, and transport controls. Each of the switches can scan up and down through files at speeds variable with your touch. QuNeo is the size of an iPad and can fit in iPad accessories such as mic clips, stands and more. QuNeo works with USB, MIDI or OSC and will communicate with your favorite music software environments right out of the box. More advanced users and programmers can use the development kit and API to create their own code to respond to QuNeo’s sensor data. KMI MIDI Expander (sold separately) allows connection to MIDI hardware via 5-pin connection. Zerodebug has released touchAble 3, the new version of its dedicated Ableton Live controller app for iPad. After being completely redesigned from the ground up last year for the release of its successful version 2, this new incarnation of the popular Ableton Live touch-controller offers a vast array of new and improved features and finally connects via a simple USB cable. touchAble 3 also now includes the new Live Device Template Pack, available as an in-app purchase, which provides 42 new templates for Live’s Instruments and Effects, all closely resembling their counterparts in look & feel. touchAble 3 is available as a free update for all existing users and is compatible with all iPad generations. 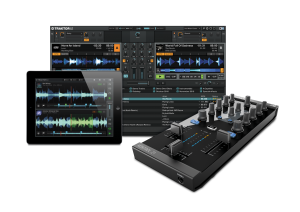 touchAble 3 includes six different modules that – combined – give you full control over Lives Session-View. Its modular interface allows to split the screen to show two modules at the same time – or to maximise the surface area of a single module. update is free for previous owners. 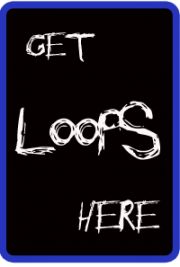 category. The update is free for previous owners. exclusively through the touchable Store within the touchable App for iPad. 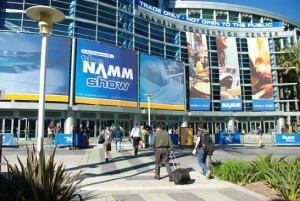 We had a blast at the Winter NAMM 2014 show. 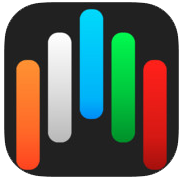 We met Sebastian from Audiobus and got a sneak peak of the new Audiobus 2 (very cool new features). Also met Wave Machine Labs, Holdernes Media, and MISELU. Here is the latest prototype C24 from Miselu.